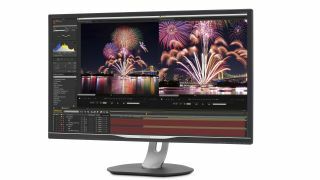 Philips has revealed a brand-new monitor that has a number of features that may well mean it will find space on your editing space sometime soon. The headline grabber is that the new Philips 328P6VUBREB is a pro display that has been given an UltraClear 4K UHD (3840x2160) screen that’s packed with High Dynamic Range 600, so nice and bright for any photo editing you might be doing on it. It also comes with a handy integrated USB-C dock - new MacBook users will be happy with this feature and it means that keyboard, mouse, and Ethernet cables can be hooked up to the docking station to avoid cable clutter. At 32 inches, it’s extra wide so you can have a number of windows up at once and the 10-bit display means that the colour gamut is an impressive 1.074 billion colours. To make use of the wide display, there’s Philips Multiview on board that will feed your desire to multitask (or spend endless hours on Twitter while editing your wares) on the same screen. For those who want to avoid eye strain when perfecting those pixels, Philips has also added a LowBlue Mode that protects you from any annoying blue light emanating from the screen. All this for what seems to be a decent price. The Philips 328P6VUBREB will hit shops in November for £559. It has all the hallmarks of something that would end up in our best monitor for photographers buying guide, so we can’t wait to get it in.